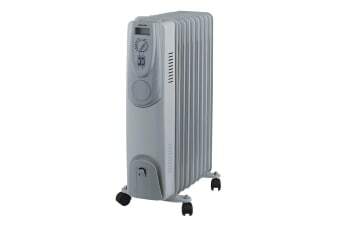 The 9 fins and up to 2000W of power of this fabulous oil heater can provide consistent, even heating of medium – large rooms, even in the bitterest of winter weather. The slim profile and noiseless operation make this heater perfect for those seeking efficient, unobtrusive warmth. The castor wheels let you easily transport the Heller 2000W 9 Fin Oil Heater from room to room, and the variable heat settings will have you perfectly cosy from the mild autumn nights to the bitterest winter mornings.